Today was stunningly gorgeous here in Massachusetts. We took a walk along the pretty babbling brook at the bottom of the hill our house sits on. Snow is almost gone!!! I can't believe the Blogging from A-Z Challenge is beginning on Monday. I think I have my topics ready to roll - but I admit...there are some days I just haven't thought of anything! Lately I've been seeing so many pieced done in this gorgeous 'micro-macrame'. I want to learn - but I have always had the hardest time with basic macrame knotting. There have been so many crafts that I sometimes just 'don't get'....and macrame knotting was one of them. 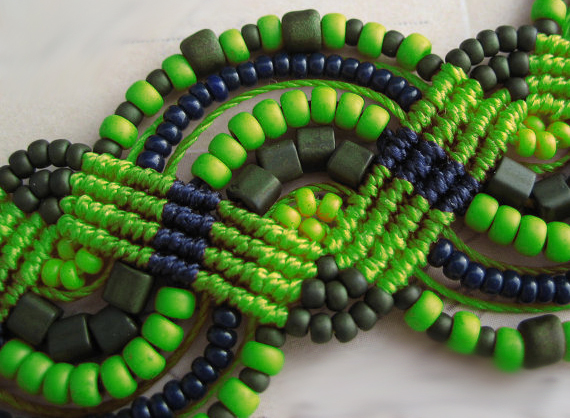 UNTIL I came across this wonderful video that made me have my 'aha moment' on macrame. I gave it a try and finally had a little success! You should have heard me in my best British accent saying "over, over, under....under, under, over"...just like the lovely lady in the video! I finally get it!!! Have a great weekend. Back on Monday when you'll hear from me 6 days a week for four weeks!!!! Wow love the bracelet you made! Great job as always! I have a hard time with macrame knotting too. I even have a hard time doing friendship bracelets. Amy, well done!!! The bracelet is very nice, love the beads you used! Can't wait to follow your daily posts! These are lovely! Nice work! I still don't but then again we all have our understanding issues right?